The park covers 600 acres (2.4 km2), and can be located from miles to the north and from the air because of the Whipsnade White Lion, a large hill figure carved into the side of the Dunstable Downs (part of the Chiltern Hills) below the white rhino enclosure. Due to its size, inside the park, visitors may walk, use the zoo's bus service, or drive their own cars between the various animal enclosures, or through an 'Asian' area where some animals are allowed to roam free around the cars. There is also a train service, the 2 ft 6 in (762 mm) narrow gauge Great Whipsnade Railway, also known as the "Jumbo Express." ZSL Whipsnade Zoo is the UK's largest zoo and one of Europe's largest wildlife conservation parks. It is home to 3,626 animals, many of which are endangered in the wild. The majority of the animals are kept within sizeable enclosures; others, such as Peafowl, Patagonian Maras, and Red-necked Wallabies, roam freely around the park. The Zoological Society of London was founded in 1826 by Sir Stamford Raffles with the aim of promoting the worldwide conservation of animals and their habitats. To this end ZSL London Zoo in Regents Park, London was established. Almost 100 years later, Sir Peter Chalmers Mitchell (ZSL Secretary 1903–1935) was inspired by a visit to the Bronx Zoological Park to create a park in Britain as a conservation centre. Hall Farm, a derelict farm on the Dunstable Downs, 30 mi (48 km) to the north of London was purchased by the Zoological Society of London in 1926 for £480 12s 10d. The site was fenced, roads built and trees planted. The first animals arrived at the park in 1928, including two Lady Amherst's pheasants, a golden pheasant, and five red junglefowl. Others soon followed including muntjac, llama, wombats and skunks. Whipsnade Park Zoo opened on Sunday 23 May 1931. It was the first open zoo in Europe to be easily accessible to the visiting public. It was an immediate success and received over 38,000 visitors on the following Monday. The brown bear enclosure is a surviving feature from the earliest days of the zoo. The collection of animals was boosted in 1932 by the purchase of a collection from a defunct travelling menagerie and some of the larger animals walked to the zoo from Dunstable station. The distinctive white lion hill figure was completed in 1933. In the early 2000s the zoo added new exhibits including Lions of the Serengeti in 2005, a walk-through lemur enclosure in 2007 (officially opened on 28 March 2007 by Dominic Byrne from The Chris Moyles Show on Radio 1, who is a regular visitor to the park), the Rhinos of Nepal exhibit in February 2007, Cheetah Rock on Easter 2008, a sloth bear exhibit in May 2008, and Wild Wild Whipsnade in May 2009. In July 2008, the Café on the Lake was reopened after remodelling, with its name changed to the Wild Bite Café. In May 2009, William Windsor (known as Billy), a goat mascot of the British Army's Royal Welsh regiment, retired to the zoo after eight years' distinguished service performing ceremonial duties. African Hunting Dogs have a new exhibit, opened in Spring 2017, it is located on the former Wolf enclosure, the enclosure is also extended to form a super enclosure for them. The Butterfly house opened in 2016, the house is home to various species of butterfly and Crocodiles, it is a Walk through exhibit so the Butterflies are flying arrive when people go through the exhibit. This house is also home to one of the largest moths in the world; the atlas moth. Passage Through Asia is a large paddock with no boundaries between visitors and the animals. Visitors can only access the area by driving through it in their own cars or riding on the Jumbo Express train. The paddock houses herds of Bactrian camels, barasingha, fallow deer, sika deer and Père David's deer. Opened in 2005, Lions of the Serengeti is home to a pride of 7 African lions . The pride of African lions includes a male named Spike, two females named Mashaka-Lia and Kachanga, three younger males named Kato, Toto and Neo, and a younger female named Kia. The four younger lions are the offspring of Spike and Mashaka-Lia, and were born in April 2006. Formerly the zoo's Dolphin Pool, Sea Lion Splash is a daily demonstration in which the zoo's three trained California sea lions (two females named Bailey and Lara, and a male named Dom) perform tricks and stunts in their pool (referred to as the 'Splash Zone').In June 2015, Dom and Bailey gave birth to a male sea lion called Oscar. ZSL Whipsnade Zoo keeps a herd of nine Asian elephants, consisting of bull Emmett, cows Mya, Lucha, Kaylee, Karishma and Azizah, Kaylee's female calf Donna, and Azizah's male calf Sam. Their paddock is seven acres, and features three pools, mud wallows and dust baths. One of the female elephants, named Karishma, and her pregnancy with her first calf George, featured heavily in the first series of the ITV documentary programme The Zoo, which follows the daily lives of the staff at both Whipsnade and London Zoo. Another female calf was born during the Queens birthday celebrations and was aptly named Elizabeth. The elephant herd has a brand new indoor facility, the Centre for Elephant Care, which opened in Easter of 2017. Opened in February 2008, Rhinos of Nepal houses a group of four Indian rhinoceros – Hugo, Beluki, Behan and a young male called Bali (born to Behan in September 2015). The building aims to be environmentally friendly, using rain water captured on the roof to fill the pools, heating the pools with solar energy and featuring barriers that are made from recycled wooden railway sleepers instead of metal bars. A daily educational show in which keepers present various bird species demonstrating their natural abilities to an audience of visitors. Birds used in the show include Blue-and-yellow macaws, European eagle owl, Harris hawks, toco toucan, bald eagle, and hyacinth macaws. A Sudan cheetah at Cheetah Rock. Opened in 2008, this exhibit is home to a group of cheetahs, and features displays that inform visitors about ZSL's cheetah conservation project in Tanzania. 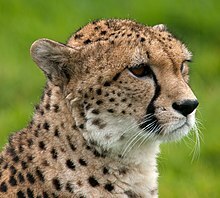 Despite ZSL's conservation project being focused on East Africa, the Cheetahs at Whipsnade are in fact Sudan cheetahs from Northeast Africa. An area aimed primarily at children and housing domesticated livestock such as turkeys, llamas, alpacas, cows, silkie chickens, horses, donkeys, and goats, most of which are free-roaming. The Children's Farm is also home to a female Bennett's wallaby named Pip, who was abandoned by her mother and hand-reared by keepers. Wild Wild Whipsnade was opened in 2010. This exhibit is home to several species of animal that lived in the wild in Britain hundreds of years ago. These include Eurasian brown bears, wolverines, Eurasian lynx, reindeer, wild boar, and European bison. Other species in the zoo's collection that are not part of a themed exhibit include Amur tigers, blesbok, Thomson's gazelle, Oriental small-clawed otters, red pandas, gemsbok, sloth bears, meerkats, Impalas, ostriches, reticulated giraffes, southern white rhinoceros, onager, Przewalski's wild horses, common chimpanzees, egrets, Caribbean flamingos, rockhopper penguins, Grévy's zebra, bongo, roan antelope, common hippopotamus, scimitar-horned oryx, Waterbuck, African penguin and ring-tailed lemurs. Animal demonstrations and include 'Sea lion splash' and 'Birds of the world'. Talks also take place daily throughout the summer season including lemur talks, giraffe browse and penguin feed. The park and ZSL receive no government funding, and rely mainly on entrance fees, memberships, its 'Fellows' and 'Patrons' scheme and various corporate sponsorships. The park takes advantage of the Gift Aid charity donation scheme. Whipsnade was one of the sets for ITV's Primeval, where a ferocious predator from the future kills a lion and three people. The zoo is one of the locations featured in BBC's Super Vets. It featured in an episode of the CBBC programme Brum in 1991, titled "Safari Park". Jamie Oliver and Sainsbury's have also used the zoo's background for a television advert. The BBC's Merlin used parts of Whipsnade as a filming location for Season 1, and the famous lion landmark is featured in behind the scenes footage from the DVDs. The zoo also served as one of the tasks for BBC Three's Young, Dumb and Living Off Mum. Tots TV visited Whipsnade. In 2002, a 20-year-old elephant named Anna died three days after giving birth to a stillborn calf. There was an allegation that the elephant suffered painful and unnecessary surgery during the birth. The zoo reported that Anna's death was due to an infection related to the still birth and that she did not "die in agony". In September 2007, two former 'tea party' chimpanzees named Koko and Jonnie, moved from London Zoo to make way for The Gorilla Kingdom, escaped from their enclosure. Koko followed one of the keepers back to the enclosure but Jonnie started heading towards public grounds. Jonnie was shot dead by the zoo's specially trained firearms squad for fears about public safety. The zoo has said that at no point were any members of the public in danger. When asked why they did not use a tranquilliser instead, ZSL spokeswoman Alice Henchley said "It's just standard procedure, if the animal cannot be quickly and safely recaptured it will be shot. We can't be sure with a tranquillizer". In the 1976 movie Rogue Male, which takes place on the eve of WW2, the central character (who has failed in an attempt to assassinate Adolf Hitler) played by Peter O'Toole jeeringly tells the Nazi (John Standing) who catches him if he would donate his remains to Whipsnade Zoo. Gerald "Gerry" Durrell, British naturalist, zookeeper, conservationist, author and television presenter also worked here. After the war, Durrell joined Whipsnade Zoo as a junior or student keeper. This move fulfilled a lifelong dream: Durrell claims in The Stationary Ark that the first word that he could enunciate with any clarity was "zoo". Beasts in My Belfry recalls events of this period. ^ "Corporate hospitality". zsl.org. ZSL. Retrieved 19 March 2008. ^ a b "Animal Inventory". zsl.org. ZSL. 1 January 2018. Retrieved 14 March 2019. ^ L. Pendar, op. cit., page 15. ^ Historic England. "Elephant House (Grade II*) (1235411)". National Heritage List for England. Retrieved 13 August 2014. ^ "Royal Welsh regimental goat retires". The British Army News. Archived from the original on 7 March 2009. Retrieved 21 May 2009. ^ "Giant moth species breed for first time at ZSL Whipsnade Zoo". ^ "Lions of the Serengeti". ^ "Death at Whipsnade". Captive Animals' Protection Society (CAPS). November 2002. Archived from the original on 30 July 2007. Retrieved 1 October 2007. ^ "Keepers shoot escaped chimpanzee". BBC News. 29 September 2007. Retrieved 1 October 2007. ^ "Whipsnade Zoo Shoots Chimp Dead". Captive Animals' Protection Society (CAPS). October 2007. Archived from the original on 27 February 2008. Retrieved 1 October 2007. A set of panels outlining the history of the zoo is located in the Lookout Cafe in the park. Wikimedia Commons has media related to Whipsnade Zoo.